L&D 1852 and a CF7 head east at Bayou Boeuf with carbon black tonnage. 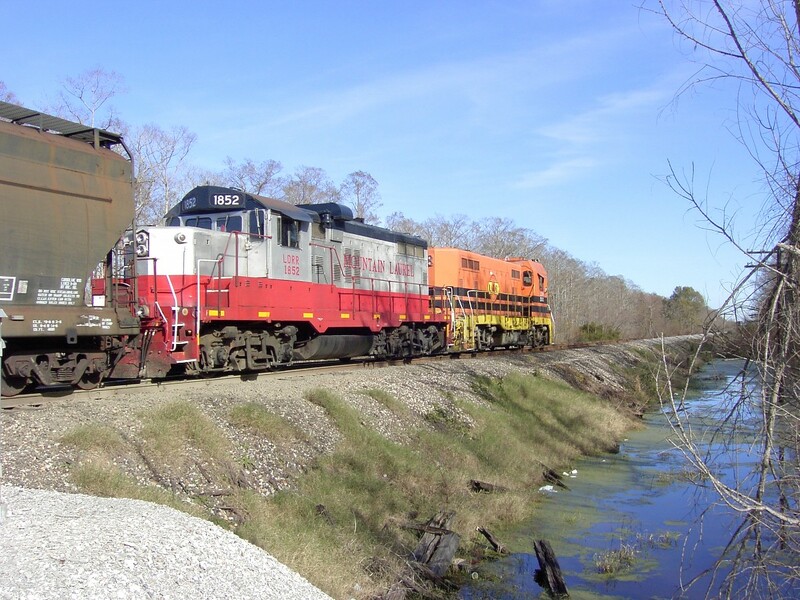 The Louisiana & Delta railroad was formed in 1987 from a group of former SP branch lines in Louisiana off of the Sunset Route. The initial power fleet consisted of five ex-SP locomotives, three GP-9E's and two SW-1200's. The GP's were numbered 3433, 3434 and 3790. These were operated in SP paint with the lettering painted out until they could be painted in the corporate colors of parent Genesee & Wyoming. The SW's were numbered 2250 (a former Cotton Belt engine) and 2263 (which retained its "frog eye" gyralights.) These engines were soon supplanted by several groups of CF-7's and then chop nosed GP-10 former Illinois Central Paducah rebuilds from Mountain Laurel. The newest engines on the roster are L&D 2000, a former C&O GP38 and L&D 2009, a former SP GP35 (nee Utah RR.) Another pair of locos have lately joined the roster as LDRR 1707 and 1708 of former IC and SLSF heritage. These were rebuilt into what the L&D calls GP10-1's.